I'm currently on 95361707 speed density. This is what the defualt MAT scaling looks like... Is this right? I have my GM IAT sensor wired into the fuel temp input, properly configured in ECUflash and I have the MAF sensor completely removed and sitting in the garage. MAT logs show unrealistically high temps; pretty much always 190-200F. 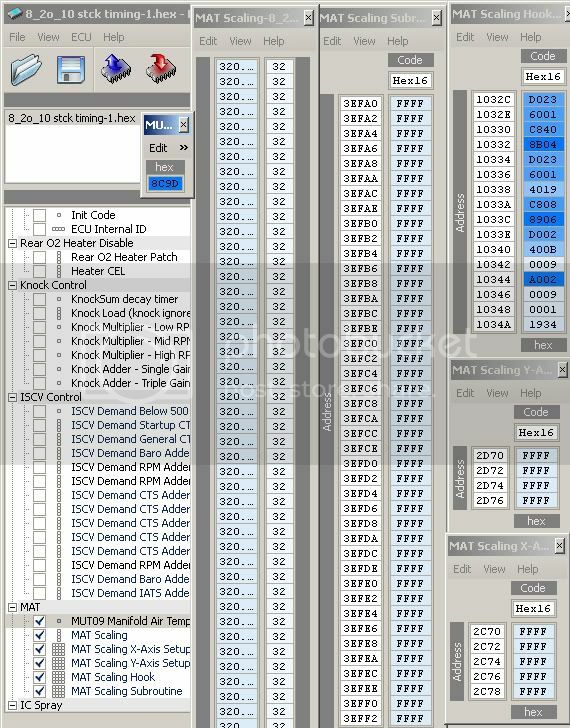 With the OEM IAT housed in the MAF gone, how does the ECU manage all of the IAT compensated functions? Does the speed density patch switch all of these functions over to the GM IAT (MAT) sensor? Last edited by 95630706; Aug 22, 2010 at 06:39 PM. I just got my gm IAT sensor wired in today and was trying to load the rom to the ecu but was receiving an error message. So i went and looked at the MAT MUT09 scalings and they look the same as yours. I also noticed that when I unpacked the rom there was two xml files for this rom, is is supposed to be like that? 95630706, those tables are not patched. Just download the ROM that mrfred has patched and copy over the settings. So I added the values in my above post and got the cruise portions of my SD map within -.47 on my LTFT Mid. I am going to tune boost sometime tomorrow. Also one thing that I noticed was that I was using Scheides guide for tuning speed density ( https://www.evolutionm.net/forums/ec...ched-roms.html) and when tuning my cruise I only adjusted the RPM-VE table and ended with numbers over 100. Should I have adjusted the MAP-VE tables at the same time? I assume if I change the Map-ve tables that the RPM-ve will need to be changed? Oh and thanks l2r99gst for the help. I wouldn't have figured it out if it wasn't for you. The car drives amazingly smooth now. Thanks for helping out The longer I use this stuff the more noob-like questions I have. How can this not be patched for MAT if SD seems to work on my car and I can see these tables, even if the temps seem high and the data looks messed up? The car also responds to changes in the cold cranking primer table (IAT dependant). With the original IAT sensor gone, Is the ECU using the MAT sensor wired into fuel temp input instead for IAT compensated funtions as well as SD calcs? On my 96533706 DMA ROM (set up by yourself I believe) the scaling looks like it is populated with good data and logs realistic numbers. 96531706 works just as good for SD but the MAT scaling is junk and logs high (posted above) could this just be an XML issue? Last edited by 95630706; Aug 23, 2010 at 07:42 AM. It's definitely not an XML issue. Those tables that you posted are exactly how they will look with a stock ROM, completely unpatched. As far as why your SD is working, it probably just has the temp fixed to that high number. It will still work fine with a fixed number, but you won't get temp compensation. As far as your cold cranking tables, I'm not sure exactly which you are talking about, but usually they are coolant temp based, not IAT temp based. And yes, from what I remember mrfred saying, any IAT based functions will now be based off of the MAT temp. You are correct about coolant temp- brain fart. Good to confirm, this may explain a lot of weird little issues I have, if all the IAT based stuff is now based off a fixed high temp from the MAT sensor. I guess I'll apply the MAT patch to my 96531706 ROM. Does Phenom realize this is not added in the DL, I thought this was standard for V7 and kind of important for SD, no? Last edited by 95630706; Aug 23, 2010 at 08:36 AM. After digging a little bit more MAT logging and MAT SD functionality seem to be separate. All the pre-patched SD ROMs that I have looked at have the same junk for data under the MAT logging section, but have plausible data in the IAT to MAT tables under "SD programing". It seems I was mistaken in assuming that MAT logging was needed for SD aside from actual logging and tuning. Still seems odd to me that w/o the patch it will log fine, but read high... Am I missing something? I'm having the exact same issue as you. Same rom 94171715 sd v7 Phenem. If you changed from tempscalefuel to tempscale and exited ecuflash, does it automatically revert back to tempscalefuel next time you open the program? 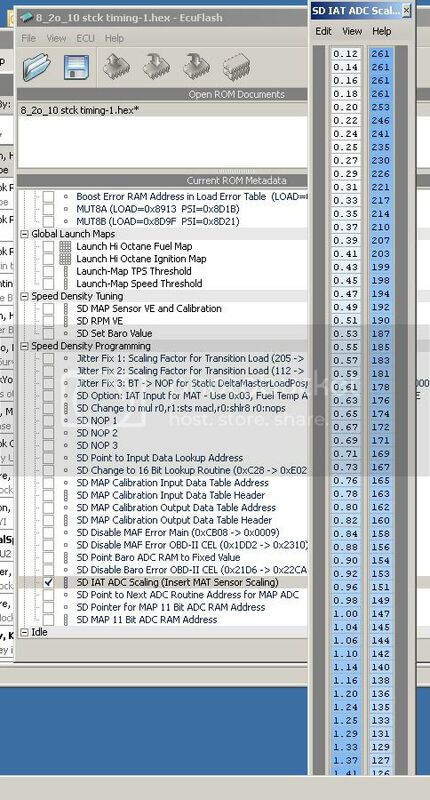 I'm just trying to get proper table values in there with tempscalefuel selected using the 0E option for converting iat to mat and can't seem to. My 3a log is about 9 degrees off ambient and logging mat at 09 reference gets me pegged around 200 plus. Did you ever sort this out? Disregard my accidental double reply. Was confusing for a sec here on my phone. Replied to the wrong thread! SD conversion map definition for fuel temp sensor? Quick Reply: MAT scale ?